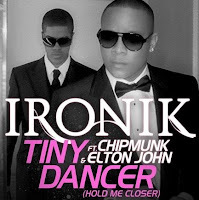 Really loving "Tiny Dancer (Hold Me Closer)" by DJ Ironik, Chipmunk and, of course, Elton John, which is at #3 this week on the U.K. chart. Of course, knowing that Ironik is only 21 and grime stud Chipmunk is a wee lad of 19 makes me want to hurl myself off a cliff. But then I remember what a senior lady Elton is, and feel much better! Meanwhile, after 20 Top 10 singles in their home country, Girls Aloud miss the upper reaches of the chart for the first time with "Untouchable"—at least upon its first official week of release. The song is #11 this week. oh and viva Lily still doing so well! I heard "Tiny Dancer" a couple of weeks ago, and instantly despised it, partially because I didn't feel like it did the original any favors, and also because the video is hideous. Did they really think "Justify My Love" is a video motif? Anyway, I gave it another shot, and heard the original version. I can live with that, but I'm still not impressed. Yeah, not a fan of "Tiny Dancer" but "Untouchable" is incredible. 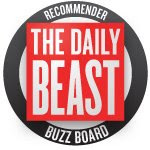 They're like Cylons or something. Cyborg music in a very real way. What a shame - Untouchable is such a great song! Hopefully they'll pick up again with the next single... maybe another note-by-note Charity Cover of a throwaway 80s song since they always do sooo well on the UK chartz. Oh, it be a fine chart position for the song that it is (which isn't all that special). The album has done well. Let them take a break. Explore doomed solo careers and a huge comeback album produced by Xenomania and a ever so likely RedOne appearance on one of the songs. Who Had The Better 'Number 1'?